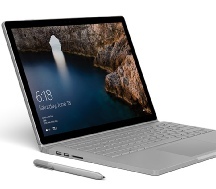 The Surface Book was released on October 2015. Due to its full size keyboard it is more like a laptop than the other Surface devices. The touch-screen for the MS Surface Book is a fused/bonded unit so replacement screens are the full Digitiser/LCD assembly. Mountain Stream Ltd can replace your touch-screen and return your repaired MS Surface Book quickly and cost effectively. The “base” of the Surface Book has been designed so as it make it nigh on impossible to repair or replace any component without destroying the unit. Therefore we do not offer any repairs other than screen replacement or OS/Windows repairs for this device. We can arrange free collection and return of your MS Surface Book in RG1, RG2, RG4, RG5, RG6 and parts of RG7, RG10, RG30 & RG31 (depending on distance). *PRICES MAY VARY. WE DO NOT KEEP THESE SCREENS/BATTERIES IN INVENTORY SO WE MAY WELL BE ABLE TO SOURCE CHEAPER THAN WHEN COSTED AND BE ABLE TO REDUCE THE REPAIR COST. For all other MS SURFACE BOOK repairs please call or use our enquiry form for a quotation.